Educating Persons with Autistic Spectrum Disorder - A Systematic Literature Review NCSE Research Conference, 2014 Caroline Bond, University of Manchester. 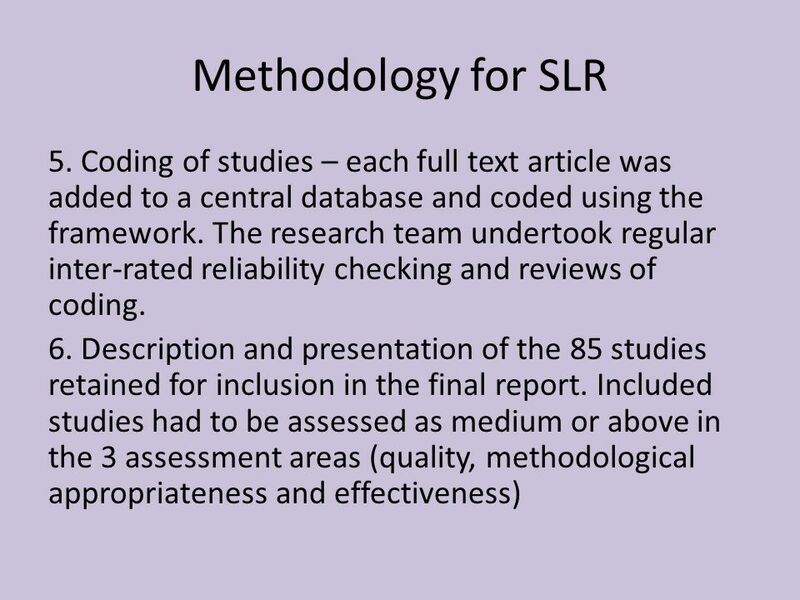 4 Methodology for SLR 3. The 1021 full text papers were screened in relation to the inclusion criteria. 845 were excluded and 176 were retained for inclusion and full coding 4. Development and trialling of coding framework specific to the review. The framework enabled description and assessment of each paper. 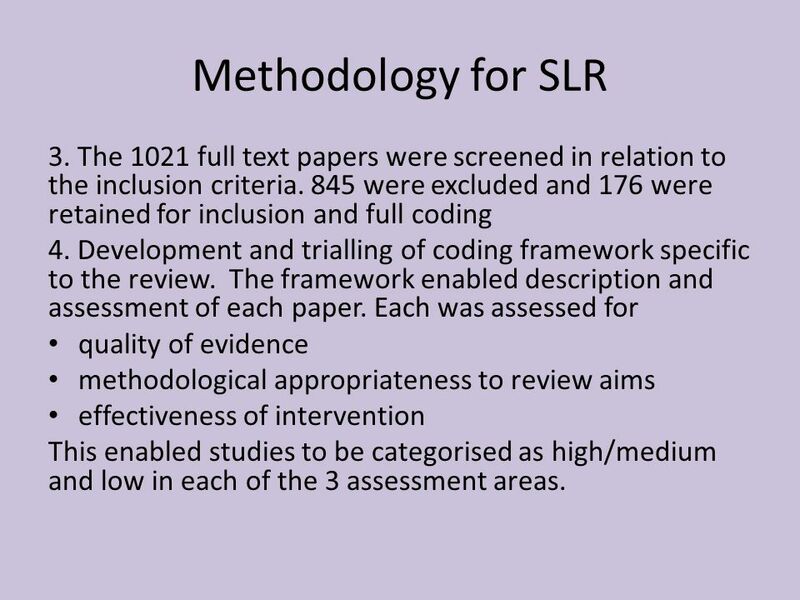 Each was assessed for quality of evidence methodological appropriateness to review aims effectiveness of intervention This enabled studies to be categorised as high/medium and low in each of the 3 assessment areas. 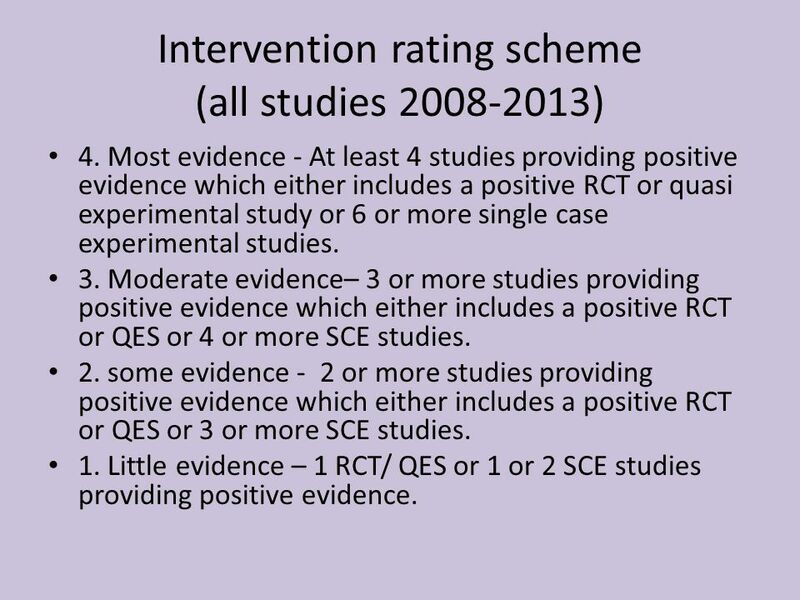 7 Intervention rating scheme (all studies 2008-2013) 4. Most evidence - At least 4 studies providing positive evidence which either includes a positive RCT or quasi experimental study or 6 or more single case experimental studies. 3. Moderate evidence– 3 or more studies providing positive evidence which either includes a positive RCT or QES or 4 or more SCE studies. 2. some evidence - 2 or more studies providing positive evidence which either includes a positive RCT or QES or 3 or more SCE studies. 1. 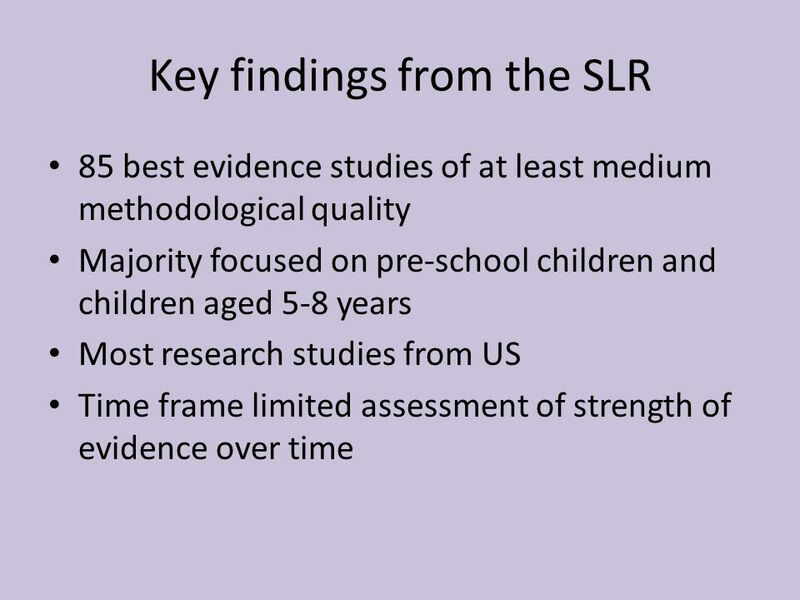 Little evidence – 1 RCT/ QES or 1 or 2 SCE studies providing positive evidence. 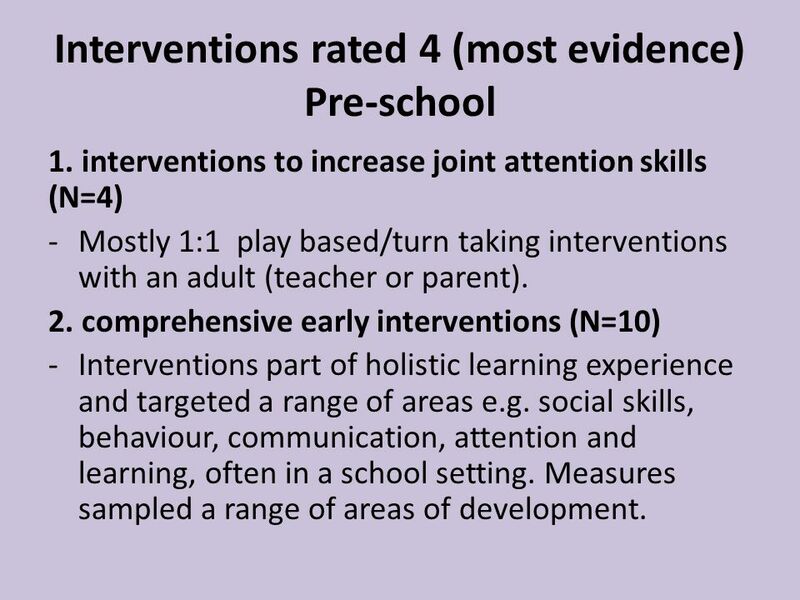 8 Interventions rated 4 (most evidence) Pre-school 1. interventions to increase joint attention skills (N=4) -Mostly 1:1 play based/turn taking interventions with an adult (teacher or parent). 2. comprehensive early interventions (N=10) -Interventions part of holistic learning experience and targeted a range of areas e.g. social skills, behaviour, communication, attention and learning, often in a school setting. Measures sampled a range of areas of development. 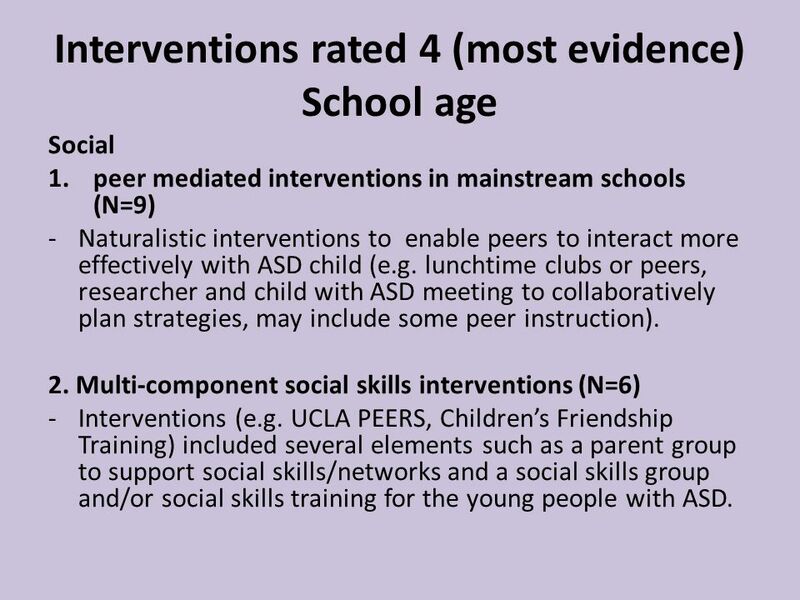 9 Interventions rated 4 (most evidence) School age Social 1.peer mediated interventions in mainstream schools (N=9) -Naturalistic interventions to enable peers to interact more effectively with ASD child (e.g. lunchtime clubs or peers, researcher and child with ASD meeting to collaboratively plan strategies, may include some peer instruction). 2. Multi-component social skills interventions (N=6) -Interventions (e.g. UCLA PEERS, Children’s Friendship Training) included several elements such as a parent group to support social skills/networks and a social skills group and/or social skills training for the young people with ASD. 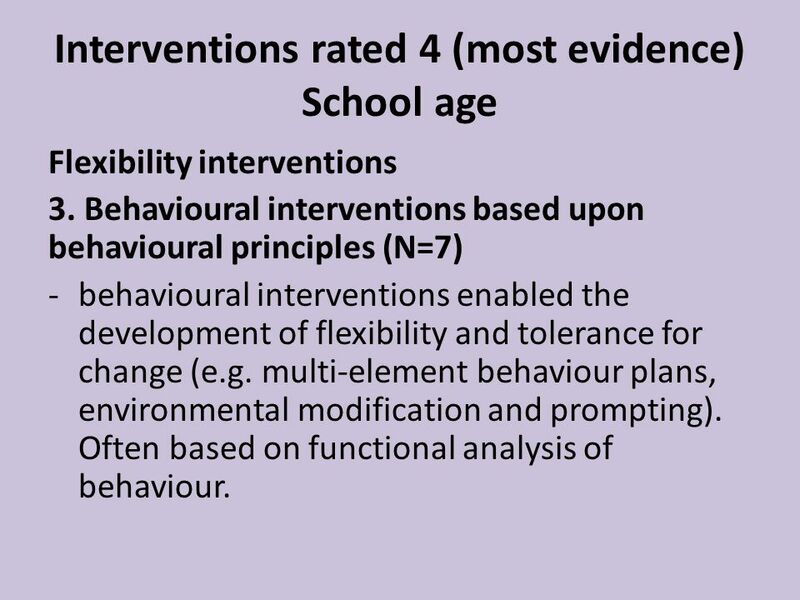 10 Interventions rated 4 (most evidence) School age Flexibility interventions 3. Behavioural interventions based upon behavioural principles (N=7) -behavioural interventions enabled the development of flexibility and tolerance for change (e.g. multi-element behaviour plans, environmental modification and prompting). Often based on functional analysis of behaviour. 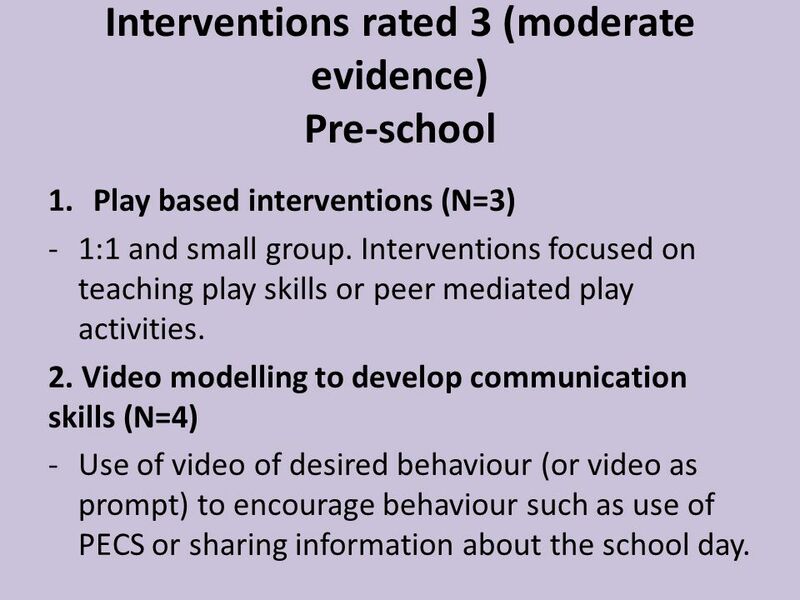 11 Interventions rated 3 (moderate evidence) Pre-school 1.Play based interventions (N=3) -1:1 and small group. Interventions focused on teaching play skills or peer mediated play activities. 2. Video modelling to develop communication skills (N=4) -Use of video of desired behaviour (or video as prompt) to encourage behaviour such as use of PECS or sharing information about the school day. 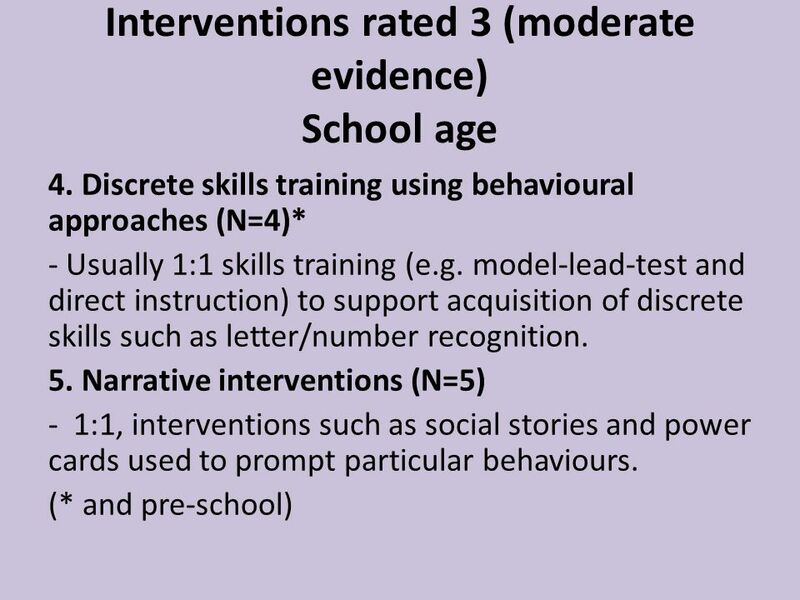 12 Interventions rated 3 (moderate evidence) School age 1. Social initiation training (N=4) - Pivotal Response Training or use of scripts to teach child with ASD to initiate social interaction. 2. Computer assisted emotion recognition interventions (N=3) -using computer programmes and video modelling to improve emotion recognition. 3. Picture Exchange Communication System in special school (N=3) -behaviourally based communication system beginning with exchange of symbols for desired objects. 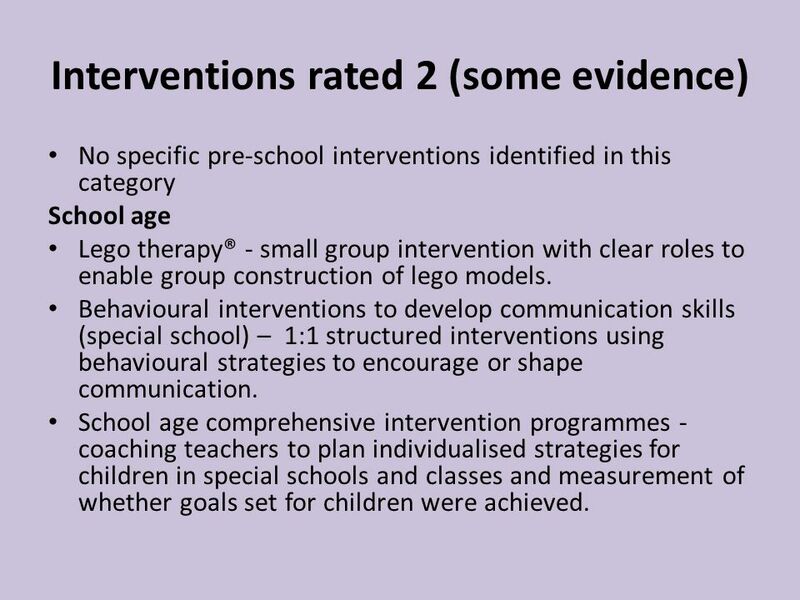 14 Interventions rated 2 (some evidence) No specific pre-school interventions identified in this category School age Lego therapy® - small group intervention with clear roles to enable group construction of lego models. Behavioural interventions to develop communication skills (special school) – 1:1 structured interventions using behavioural strategies to encourage or shape communication. School age comprehensive intervention programmes - coaching teachers to plan individualised strategies for children in special schools and classes and measurement of whether goals set for children were achieved. 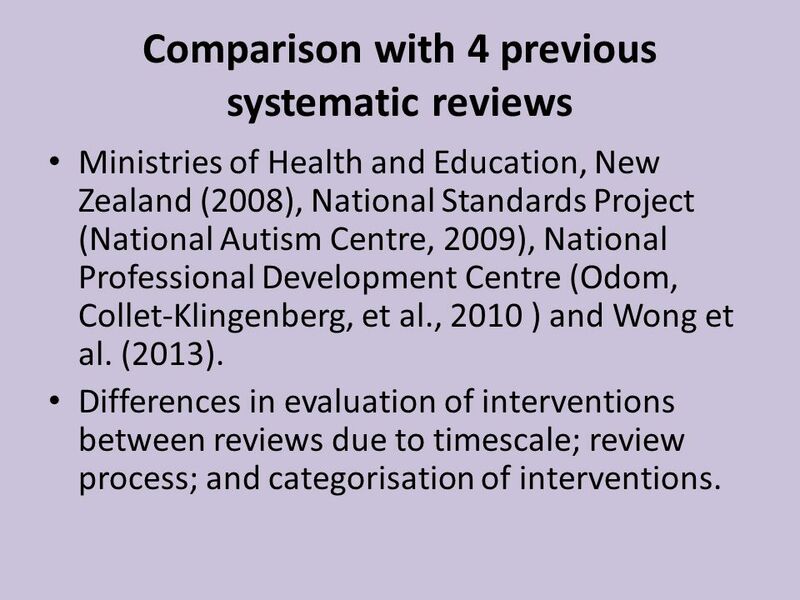 15 Comparison with 4 previous systematic reviews Ministries of Health and Education, New Zealand (2008), National Standards Project (National Autism Centre, 2009), National Professional Development Centre (Odom, Collet-Klingenberg, et al., 2010 ) and Wong et al. (2013). Differences in evaluation of interventions between reviews due to timescale; review process; and categorisation of interventions. 16 Differences between reviews Range of behavioural interventions smaller in current review so fewer categories. Multi-component social interventions not always included in previous reviews as relatively new. 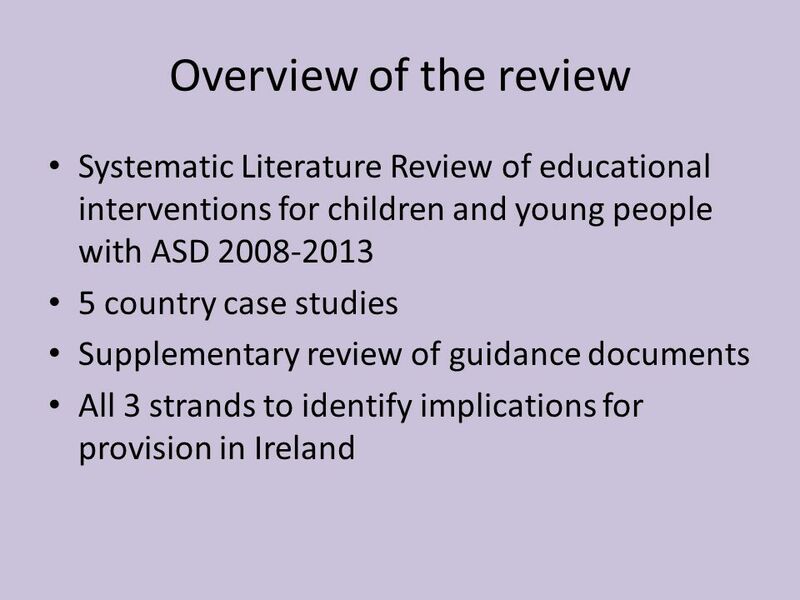 Comprehensive pre-school interventions a category in the current review but not always included as a category in some previous comprehensive reviews. Parent implemented interventions a distinct category in some reviews but not current review. Attention treated as an outcome rather than an intervention types in some reviews. Technology assisted category has grown in recent years. 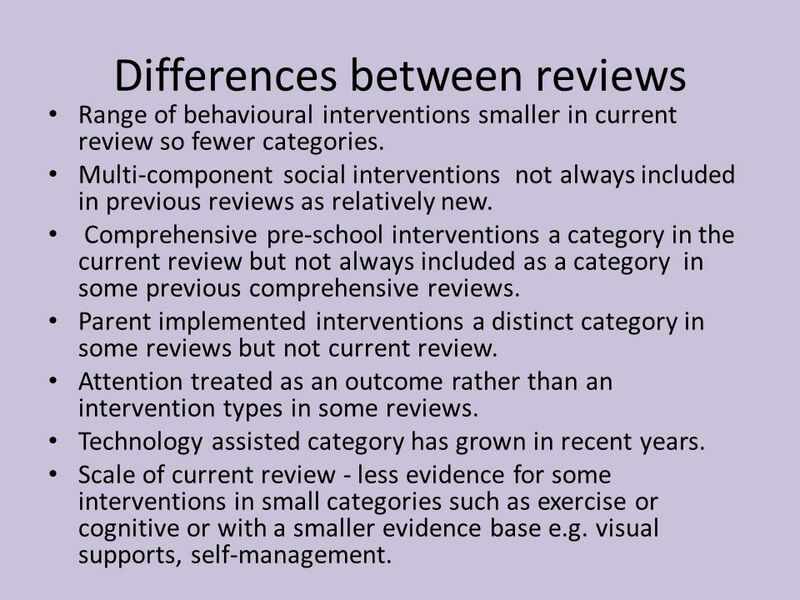 Scale of current review - less evidence for some interventions in small categories such as exercise or cognitive or with a smaller evidence base e.g. visual supports, self-management. 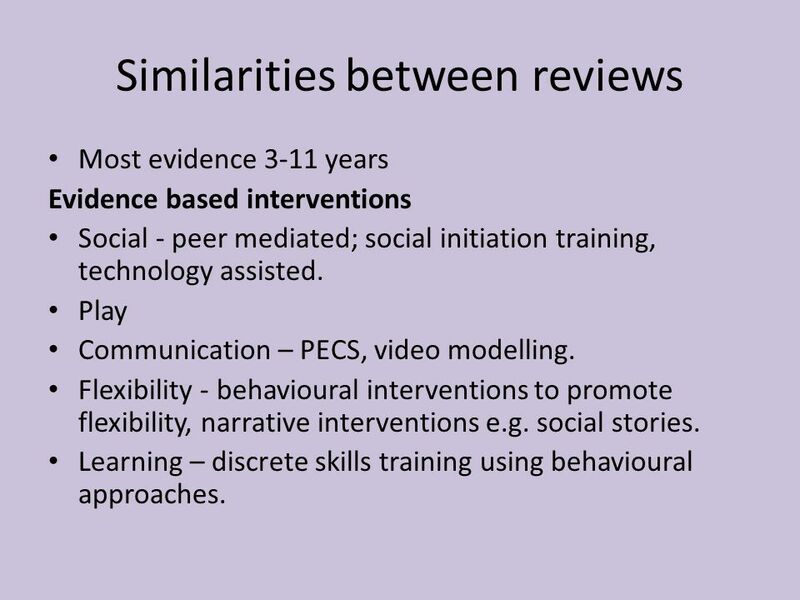 17 Similarities between reviews Most evidence 3-11 years Evidence based interventions Social - peer mediated; social initiation training, technology assisted. Play Communication – PECS, video modelling. Flexibility - behavioural interventions to promote flexibility, narrative interventions e.g. social stories. Learning – discrete skills training using behavioural approaches. 18 Key findings from the guidance documents 15 documents, from Northern Ireland, USA, Australia, Canada, New Zealand and UK. Policy context influenced availability of guidance. Policy orientation influenced research/good practice balance. In most a strong commitment to inclusion. More documents focused on pre-school children. Promising examples e.g. 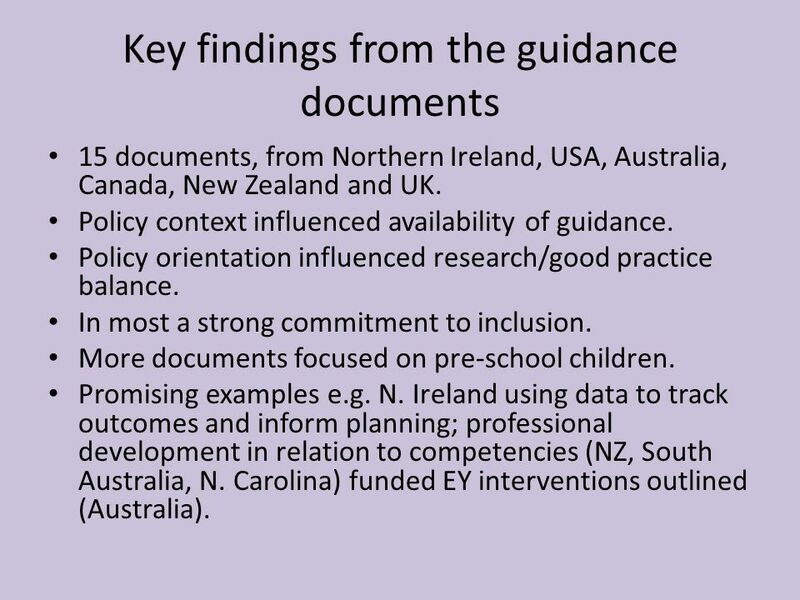 N. Ireland using data to track outcomes and inform planning; professional development in relation to competencies (NZ, South Australia, N. Carolina) funded EY interventions outlined (Australia). 19 Guidance and SLR comparison Recommended interventions similar to those endorsed by reviews as drew on the same SLRs. Differences few but related to interventions where the evidence base was smaller e.g. 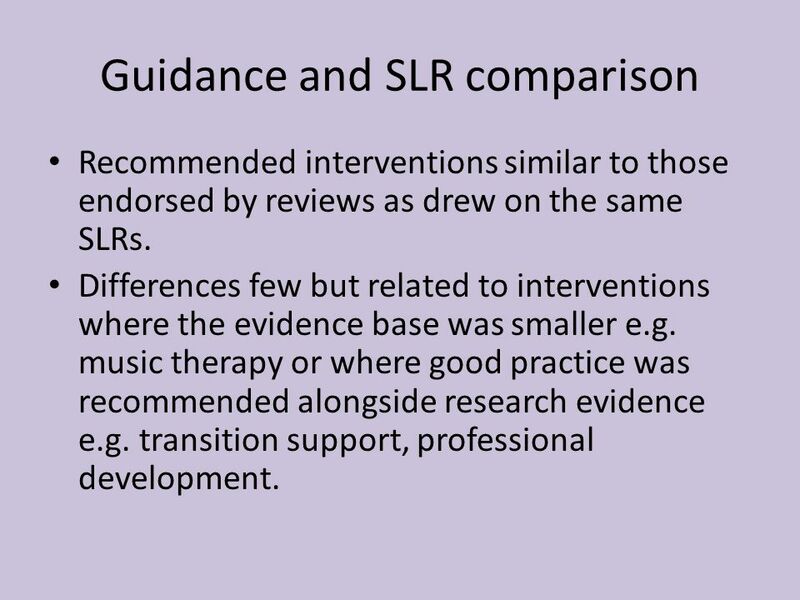 music therapy or where good practice was recommended alongside research evidence e.g. transition support, professional development. 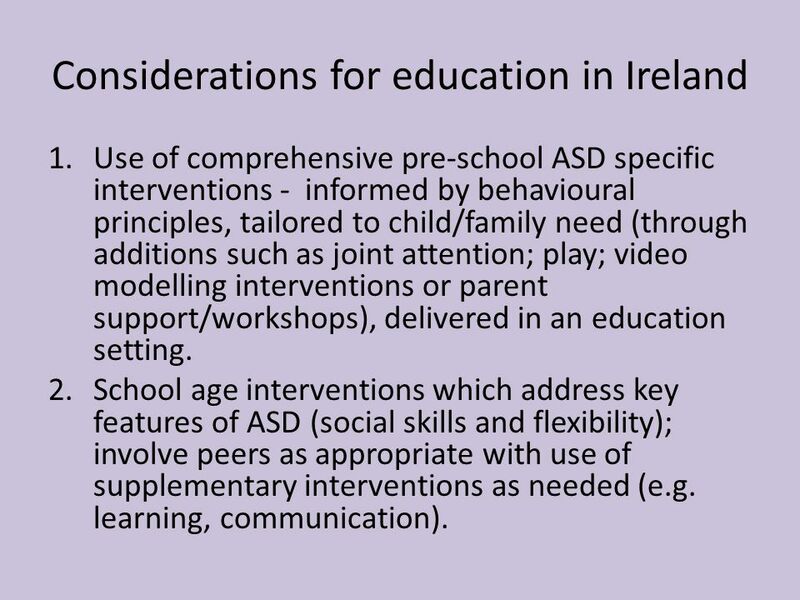 20 Considerations for education in Ireland 1.Use of comprehensive pre-school ASD specific interventions - informed by behavioural principles, tailored to child/family need (through additions such as joint attention; play; video modelling interventions or parent support/workshops), delivered in an education setting. 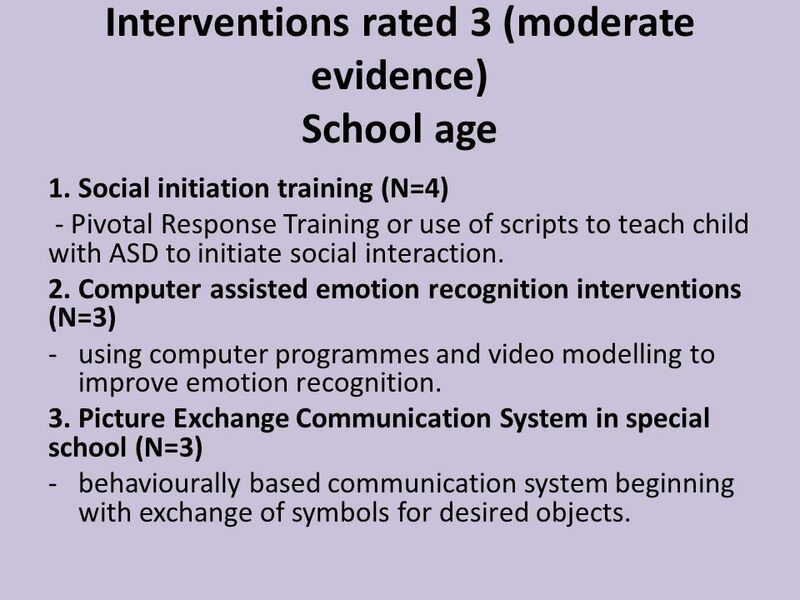 2.School age interventions which address key features of ASD (social skills and flexibility); involve peers as appropriate with use of supplementary interventions as needed (e.g. learning, communication). 21 Considerations for education in Ireland 3. Guidance which provides a clear framework for families and practitioners and draws upon good practice in addition to research literature as required. 4. A professional development framework. 5. Further development of collaborative research partnerships between researchers and schools. 6. 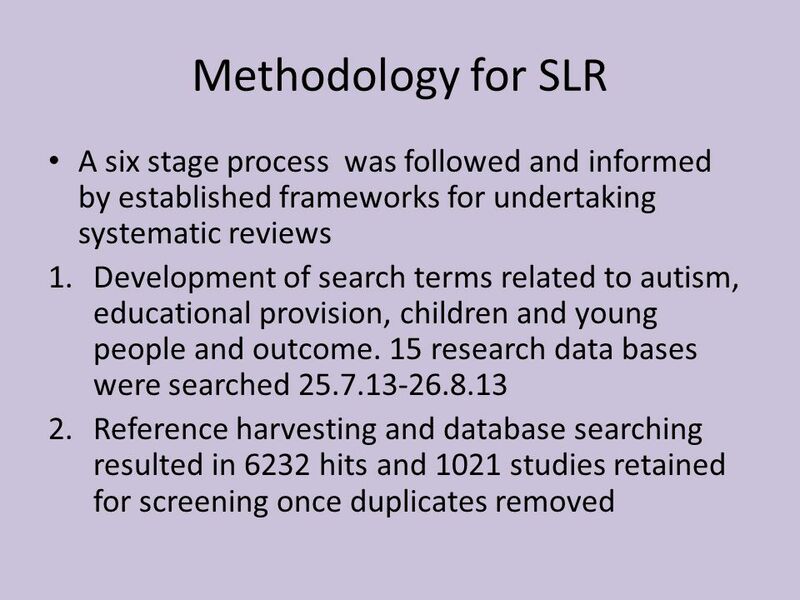 Further development of ASD evidence base. 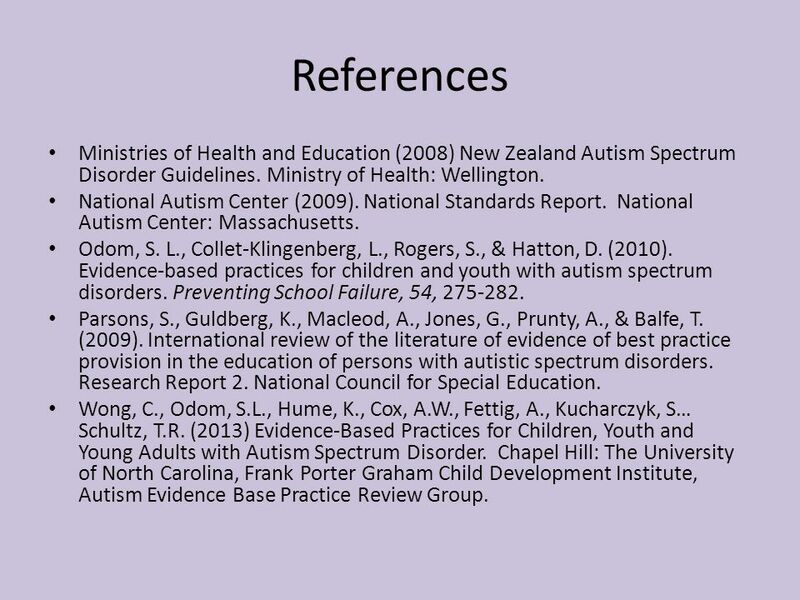 22 References Ministries of Health and Education (2008) New Zealand Autism Spectrum Disorder Guidelines. Ministry of Health: Wellington. National Autism Center (2009). National Standards Report. National Autism Center: Massachusetts. Odom, S. L., Collet-Klingenberg, L., Rogers, S., & Hatton, D. (2010). Evidence-based practices for children and youth with autism spectrum disorders. Preventing School Failure, 54, 275-282. Parsons, S., Guldberg, K., Macleod, A., Jones, G., Prunty, A., & Balfe, T. (2009). International review of the literature of evidence of best practice provision in the education of persons with autistic spectrum disorders. Research Report 2. National Council for Special Education. Wong, C., Odom, S.L., Hume, K., Cox, A.W., Fettig, A., Kucharczyk, S… Schultz, T.R. (2013) Evidence-Based Practices for Children, Youth and Young Adults with Autism Spectrum Disorder. Chapel Hill: The University of North Carolina, Frank Porter Graham Child Development Institute, Autism Evidence Base Practice Review Group. 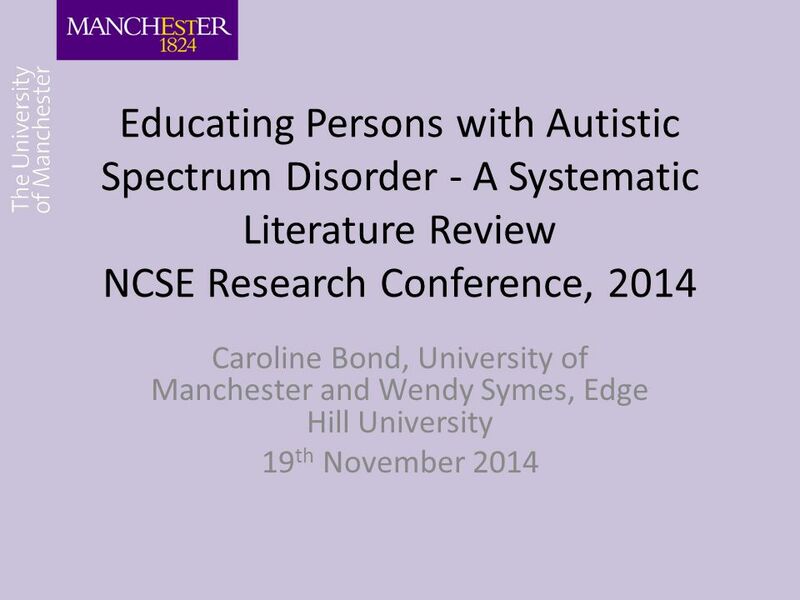 Download ppt "Educating Persons with Autistic Spectrum Disorder - A Systematic Literature Review NCSE Research Conference, 2014 Caroline Bond, University of Manchester." Optimizing Outcomes for Early Identified Children Through Inclusive Service Provision Sarah Wainscott & Marion Helfrich The River School Washington, D.C. Solutions Towards Everyday Problems Debbie Mclean Senior Practitioner Family Support Workers Team Pali Obhi YISP Coordinator. Social and cultural context in assessment – can one size fit all? © McLachlan, Edwards, Margrain & McLean 2013. Evidence- Based Practices in Autism Spectrum Disorders Carla Querobim & Donna Rudford San Diego Unified School District National Autism Center. School-wide Positive Behavioral Interventions and Supports & Students with Autism Jointly developed by the above organizations with funding from the U.S.
Social inclusion of young children with Autistic Spectrum Disorder in Australian early childhood programs Sue Walker and Donna Berthelsen Queensland University. 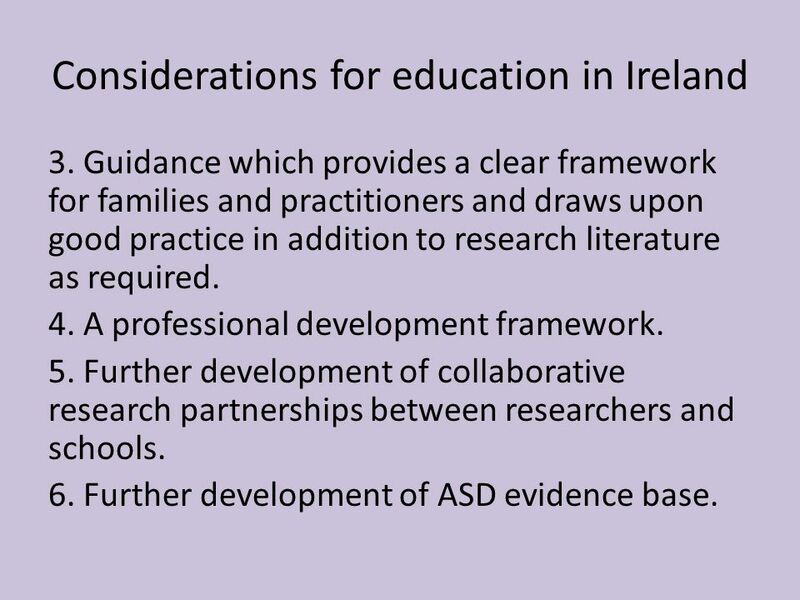 DRAFT GUIDANCE CONSULTATION Criteria for applying for an Education and Health Care Plan (EHCP) for pupils on the Autism Spectrum Introduction: From September. Celebrating Effective Partnerships The Early Intervention Autism Spectrum Disorder Project in Action. The Behavioural/Developmental Continuum of Interventions for Autism Spectrum Disorders: A Systematic Review Many Faces of Childhood Well Being: The Early.